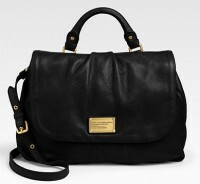 As I suspect many of you are, I’m a little bored with the Marc by Marc Jacobs Classic Q line. Yes, it’s a great idea – classic bags in thick, high-quality leathers for a reasonable price. But even great ideas can wear out their welcome without a shot of newness every now and then.